The region of Meaux came dangerously close to being occupied by the advancing German army in September 1914. The German onslaught had already laid waste to the surrounding villages of Chambry, Barcy, Montyon, Varreddes, and Chauconin-Neufmontier, where this image was taken. Meaux was well within their sights, and as the Germans approached, the residents of Meaux fled to Paris. A counterattack was organised to repel the Germans. French forces, along with the British Expeditionary Force, withstood the attack and drove the Germans back towards the Somme, where fronts were solidified and the stage was set for three years of attritional trench warfare. The assault halted the German advance, saved Paris, and threw a spanner in the works of Germany’s Schlieffen Plan. As such, it came to be known The Miracle of the Marne. The windows are barred and boarded in the wrecked buildings which form the backdrop of this image. It is dated 1914, and although it is unspecified whether the photograph was taken pre or post the Miracle of the Marne, the ruins and rubble suggest that this occurred after the village had been occupied. The caption simply reads, Chauconin près de Meaux: cyclistes traversant le village (Chauconin near Meaux; cyclists crossing the village). Bicycles were most commonly used to relay messages from command to outposts on both sides of battle lines. Hitler had been a bicycle messenger during the First World War. 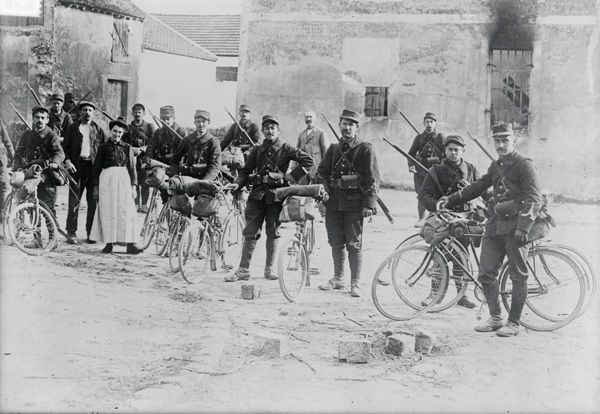 Eleven French cycling soldiers and three civilians face the camera, the soldiers looking proud but weary leaning on their bicycles. The civilians are inquisitive; the man at the rear appearing to peer in to see what is going on. The guns slung over their shoulders emphasise the diagonal line hinted at by the wrecked stair case, sloping roof, and the cross beam of the boarded window behind them. The only woman in the photo appears on the left and seems to be smiling, perhaps proud to see these soldiers off or happy that they have returned alive.